An era that brings to mind F. Scott Fitzgerald, The Great Gatsby, flappers, and endless parties, the 1920s and 1930s are the perfect inspiration for your engagement party. You can combine the romantic nostalgia of Gatsby and Daisy with the stunning architectural details to create a one-of-a-kind Art Deco vintage engagement party that no one will ever forget. Just remember--you've got to top this when your guests show up at your wedding in a few months, so be sure you have an even more incredible theme for that! (1) An incredible venue. 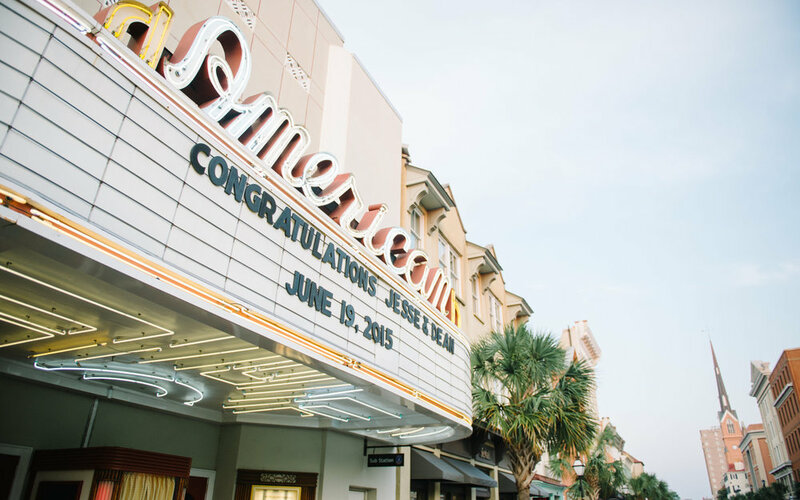 If you're looking for an authentic Art Deco venue, The American Theatre in Charleston is perfect: built in the 1940s in the Art Deco style, it needs little decoration for a picture perfect night. If you're not in Charleston, don't worry! You can add some flapper glam to just about any space: just look for an event venue that has geometric detailing and vintage charm, or add your own with a few Art Deco decorations. (2) Art Deco invitations. The invitations above are from Etsy, and the stark color scheme and detailing make for a perfect vintage engagement party invite. (3) Authentic details. Add in vintage details throughout your party--from your dress to the table runners (shown above) to wine labels to fun flapper necklaces to hand out to your guests. (6) Lots of crystal. Bring on the champagne glasses, candle holders, and vases: the intricate carvings of crystal reflect light in just the right way, and the geometric facets are a perfect complement to your overall theme. (7) A vintage headband. Whether you find one at an antiques shop or you decide to order an imitation online, a vintage (or vintage-inspired!) headband can be the crowning touch to your engagement outfit. Wear it as a crown or to pull your hair back: you're sure to be stunning either way. (8) Mood lighting. In addition to the flickering candles, you'll want to add in some delicate lighting strands for ambiance. Your guests will be relaxing, sipping their cocktails, and dancing the night away before you know it. (9) A neutral color palette. When throwing an Art Deco party, you cannot go wrong with a metallics and black color palette: gold and silver are both perfect choices that pop against a dark background. Add in some pink for a little bit of fun and you've got a color scheme that will wow everyone. Are you dreaming of an Art Deco vintage engagement party? Tell us what you'd add to the must-have list in the comments!